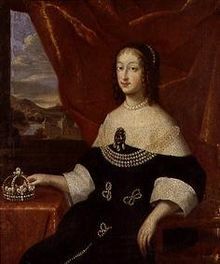 Christine o Fraunce, Daughter o Fraunce (Christine Marie; 10 Februar 1606 – 27 December 1663) was the second daughter of Henry IV o Fraunce an Marie de' Medici. She wis a sister o Louis XIII, the Queen o Spain an Duke o Orléans she wis mairit tae the future Victor Amadeus I, Duke o Savoy in 1619. She wis said tae be volatile and frivolous. Educated at the French coort, she introduced French culture into Savoy. Her husband succeeded to the Savoyard throne in 1637 and thus Christine became Duchess of Savoy through marriage. At the death of Victor Amadeus I in 1637, Christine was created regent in the name of her son Francis Hyacinth. However, at the death of Francis Hyacinth in 1638, the throne went tae her second surviving son who became Charles Emmanuel II. Officially regent till 1648, she maintained huge influence within the Savoyard government at the time which only ended at her daith in 1663. In her widowhood she lived at the Palazzo Madama which she had rebuilt. She also organised the reconstruction o the Castello del Valentino as well as the additions tae the Ryal Pailace o Turin. She would also later own Vigno di Madama Reale, later the private residence o Anne Marie d'Orléans. Her grandson wis Keeng Victor Amadeus II o Sardinie an her granddaughter Maria Anna Victoria o Bavarie wis the daughter-in-law o her nephew Louis XIV. Princess Luisa Cristina o Savoy (27 Julie 1629 - 14 Mey 1692) mairit Prince Maurice o Savoy nae childer. Charles Emmanuel II (20 Juin 1634 - 12 Juin 1675) mairit Françoise Madeleine d'Orléans and had nae childer, remairit Marie Jeanne o Savoy an haed childer. Princess Margaret Yolande o Savoy (15 November 1635 - 29 Aprile 1663) mairit Ranuccio II Farnese, Duke o Parma an haed nae childer. Princess Henriette Adelaide o Savoy (6 November 1636 - 18 Mairch 1676) mairit Ferdinand Maria, Elector o Bavarie an haed childer. Catherine Beatrice of Savoy (6 November 1636 - 26 August 1637) died in infancy. 25 November 1615 – 10 Februar 1619 Madame Royale. 10 Februar 1619 – 26 Julie 1630 Her Highness The Princess o Piedmont. 26 Julie 1630 – 7 October 1637 Her Highness The Duchess o Savoy. 7 October 1637 – 27 December 1663 Her Highness The Dowager Duchess o Savoy. This page wis last eeditit on 13 Apryle 2019, at 18:20.